Co-Founder and President of Bahamas Engineering and Technology Advancement (BETA). Moreover, she has received several awards including the Bahamas National Academic Scholarship, BORCO Scholarship, Grand Bahama Port Authority Scholarship, NSBE Region II Academic Excellence Award and a Graduate Research Assistant Fellowship from her university. As a college student Trenicka has worked with elementary and middle school students throughout the academic year as a mathematics tutor. 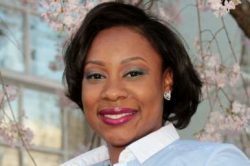 In addition she has worked in summer programs at the Virginia Institute for Science Teaching Achievement as a program facilitator to help students and teachers foster an understanding of engineering fundamentals. In particular, as a graduate student Trenicka worked as researcher on a grant funded project by the National Institute of Health focused on ventilator induced lung injury (VILI). She performed finite element analysis (FEA) and computational fluid dynamics (CFD) on 3 dimensional lung models in order to understand varying degrees of stress/strain via lung disease and mechanical ventilation. She then went on to work at Trimech Solutions LLC as a Computation Fluid Dynamics Engineer as a contractor in the Modeling and Simulation Group at Altria Group of Companies. Trenicka returned to the Bahamas last July and since then has worked in education at Sunland Baptist Academy as a Mathematics, Literature and Language Teacher. Trenicka intends to return to work as a Research Engineer and in her spare time she enjoys cooking, baking, studying Mandarin Chinese, watching Asian dramas and when she has time writing with hopes to publish her own novel.